Hi, I would like to get everyone's thoughts on the Lunar Lander pre-launch. 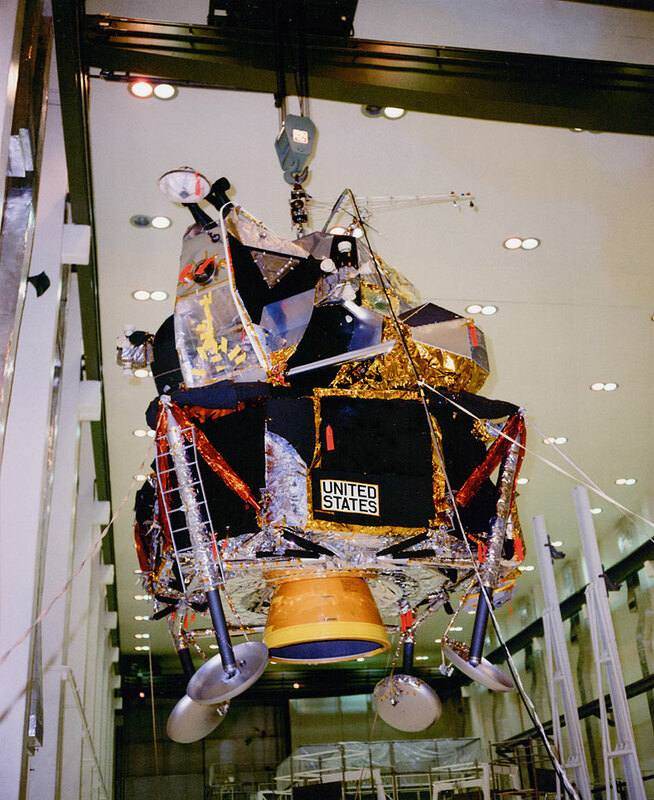 NASA doesn't provide a lot of documentation of the LM just prior to Apollo 11's launch. 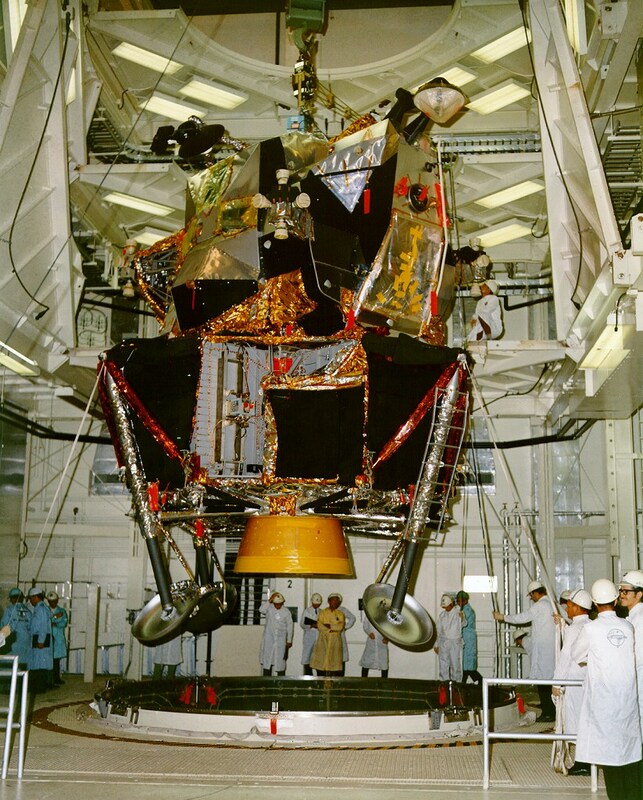 For instance, there appears to be no pictures or video of the Lunar module being inserted into the Saturn stage. 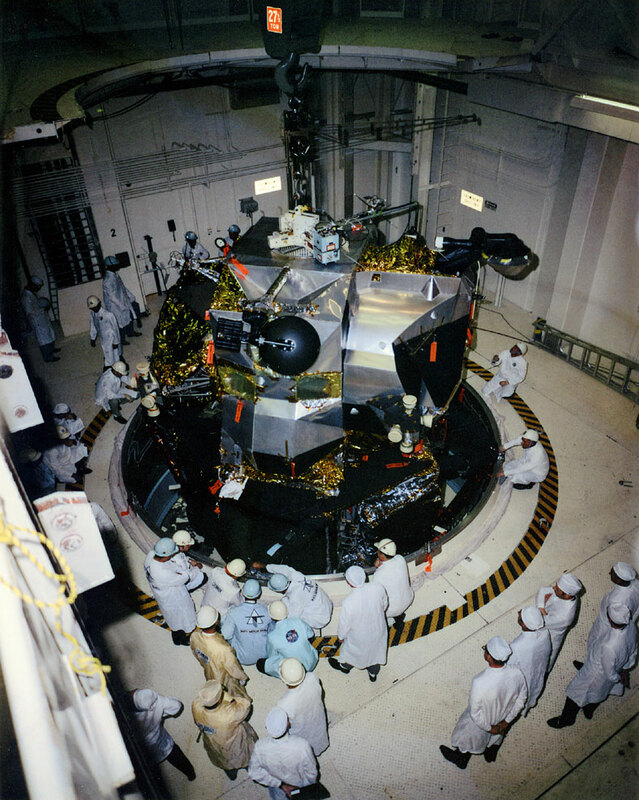 (you would think this would be important to document) But there are some NASA photos of the Lunar Module just prior to insertion and post insertion as it is about to be mated to another Saturn stage. Here is a NASA photo of the LM post production being moved to assembly. And here is a NASA photo of the LM inserted in the stage as it is being lifted to be mated with another Saturn stage. What is evident with these pictures is the fact the LM looks significantly different from the LM seen in space and on the moon's surface. It is missing many features such as the black and copper insulation. It is also missing the RCS plume deflectors. Even the ladder is taped differently. The undercarriage of the LM in the photo where it has already been inserted in the Saturn is completely different from the LM seen in space. Not only are the legs black and not wrapped, the underside frame is completely lacking any of the black and copper insulation. How was all this changed once the LM was already in the Saturn? It had a complete makeover. Even plume deflectors were added. These are not cosmetic changes. The plumes were large and had to be attached firmly and accurately. Are we to believe all these changes were done on the pad? There are one or two references that seem to suggest this is what happened. Anything is possible but this doesn't seem very plausible. Yes there is a small hatch on the Saturn stage that housed the LM, but inside was extremely tight and dark. (photos of the separation stage in space shows very little room inside the stage that housed the LM) How they added all the coverings let alone the plume deflectors escapes me. Furthermore they were desperate to cut weight to the point, I believe, they were offering contractors $50k for every pound they could shave off. And yet they go to the launch pad last second and add all this. It defies reason. The deflectors were never tested but they were added in the dark on the launch pad? The deflectors, themselves, are very problematic. You have rocket thrust literally trusting back onto the vehicle. How the ship (any ship for that matter) does not go into an uncontrolled spin is a miracle. There is even a MIT paper published in 1969 suggesting the deflectors would cause the craft to go into an uncontrolled spin in any situation short of perfect conditions. And perfect conditions would require a perfectly balanced/weighted ship and perfectly equal and timed trusts on opposite sides. Conditions they felt were not possible. Given, I believe, the Apollo 11 mission used the thrusters 3-4000 times up to 30 seconds at a time it seems truly remarkable the craft remained stable as the engines thrust back into the craft. In any event, I would love to hear people's thoughts on these issues. (and btw are there any vehicle/craft out there that thrusts back on itself like the LM?) Thanks. And the LMs do look like the ones in the images. You do know that each LM looked alittle different, don't you? 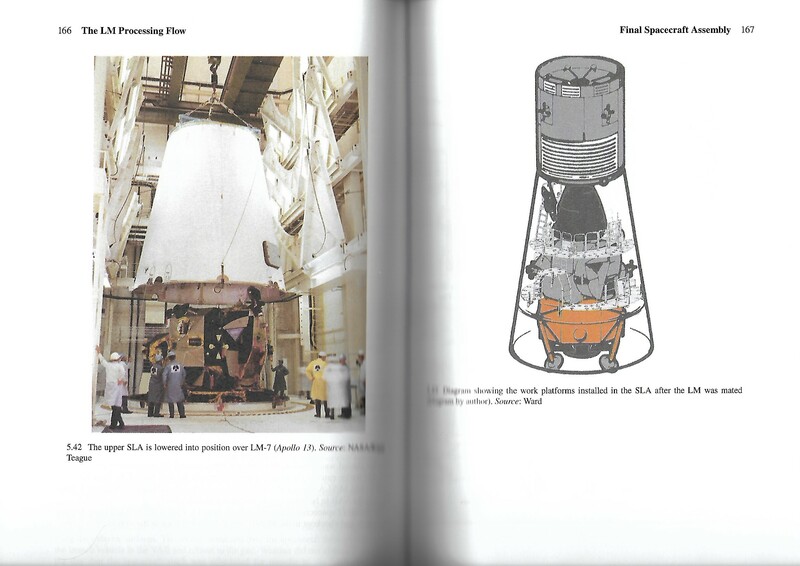 I haven't found a specific reference to the plume deflectors, but there is a description of ground crews working to install and check equipment on the LM once in place inside the Saturn - accessed via a hatch in the SLA, and the difficult and cramped conditions under which they worked. There are many photos of the LM in production. I am not disputing that. There are few post production photos in the assembly area. And if you look closely at the photo (I recommend you download a hi resolution photo) I attached with the LM inserted in the Saturn stage you will see the undercarriage and legs do not resemble the LM in the photos seen in space or on the moon's surface. This page I have just scanned from the book I mention above has two interesting pictures. Firstly it shows the LM mated with the rest of the Saturn prior to the upper SLA covering it up. There is evidently room to work on the LM there, although the LM was not apparently exposed for long. Secondly, it shows the arrangement of working platforms inside the SLA once that has been mated with the rest of the rocket. IIRC, the plume deflectors were indeed a last-minute addition to the Apollo 11 LM. There's an Apollo Experience Report on Thermal Protection from Engine Plume Environments that describes them in detail. ...if you look closely at the photo (I recommend you download a hi resolution photo) I attached with the LM inserted in the Saturn stage you will see the undercarriage and legs do not resemble the LM in the photos seen in space or on the moon's surface. ...ever look like exactly the same when it is unfolded and the wrappings taken off? I see differences too but I don't question them, because I'm quite ignorant of the details of spacecraft assembly so I assume, with some justification, that the experts concerned know what they are doing and that what they do is the right thing to do in the circumstances so everything will turn out fine. Every time I'm about drive across a bridge or walk onto a boat or aeroplane I think about it in a similar way. Don't you? If you want answers to your questions, why don't you school yourself properly about spacecraft assembly in general and Apollo assembly in particular, and after five years of study, ask experts about what you've missed? We do have at least two members who know a fair bit about the subject so maybe they will help, but they might be laughing too hard or cringing too much to reply promptly. Finally I must ask, why are both of your threads in the hoax section, instead of the Reality of Apollo section? Puzzlement over some wrapping and folding is hardly justification for claiming a hoax, and if you're not claiming one, there is a more proper place for such queries. The list is about the 16mm silent film on the first part of Disc 1 of the Apollo 11 original 3-DVD set from Spacecraft Films, and there might be more tucked away on the Mighty Saturns sets. The current Apollo 11 set might have more too. So the LM and CSM were installed in the SLA by 10 Apr 1969 and there's 10 minutes of film about it on the DVD. Perhaps a month before Rollout and three months before launch was sufficient time to get those wrappings off. Others oldies who were around at the time will possibly remember the fears some laypeople had about what Earth germs might do to the Moon, and even worse, what Moon germs might do to us. So I wonder if those external wrappings got some special visual treatment for the public's benefit, the same as a few other procedures did. Hi Kiwi, thanks for your input and help. And I respect your opinion regarding questioning things but respectfully disagree. Even though I feel I am "well schooled" on the subject, I think people should have the right to question things regardless. I don't think you literally need to be a "rocket scientist" to question things that seem odd or unusual. Yes most questions might have easy or obvious answers but you would be surprised on how many things that seem self evident/obvious but under scrutiny fall apart. A perfect example of this is the very limited visibility from within the LM to operate and maneuver. People take it for granted the LM was not visibility impaired because the flights went off with 'little' issues. Yet, having said this, it literally takes people using a back up camera and 360 degree visibility to back up out of their driveway but we take it for granted the Apollo LM was able to operate drone like (moving up to 5000 ft per second) with 2 small side windows for visibility without incident. One just has to look at the DAC footage taken from these windows to understand things are not as straightforward as we think. With regards to changes on the LM pre-flight, official documentation (what little there is) says all these changes occurred post roll out on the launch pad. Again, seems a bit odd and concerning all this was done last minute on the launch pad. This leaves very few people to confirm this. Moreover it demonstrates NASA took huge risk installing untested plume deflectors at the very last minute. And there seems to be no scientific documentation (from NASA) on how these plumes would affect the stability of the craft. Yet there exists scholarly papers that suggest these plumes would create significant stability issues. This is a perfect example of where people just accept something because it most work otherwise it wouldn't be on the craft. I would love for someone to show me a craft/vehicle in which it's engines thrust directly back onto its own body. Believe me I have asked many people over the years and get no answers. Anybody out there have an example? Thanks. This is simply untrue. I've been reversing out of my driveway without the benefit of a camera for years. The need for 360 degree visibility is not related to doing the actual manouvre either, it is because when driving there are many possible hazards coming at you from many directions for you to be aware of. I could reverse off my driveway quite happily without even looking if I knew there was no-one else around to be hit by my car while I move it. Piloting a lunar module to a landing on the Moon no-one is going to be walking by or trying to pass you, so you can focus very narrowly on getting it down. but we take it for granted the Apollo LM was able to operate drone like (moving up to 5000 ft per second) with 2 small side windows for visibility without incident. One just has to look at the DAC footage taken from these windows to understand things are not as straightforward as we think. Again, visibility is not such an issue when you have only one thing to look at (the ground) and a radar to tell you how far away from it you are. 'Seems a bit odd' is not a very meaningful argument. Moreover it demonstrates NASA took huge risk installing untested plume deflectors at the very last minute. Who says they were untested? And how much testing does a plume deflector need? Yet there exists scholarly papers that suggest these plumes would create significant stability issues. You've made this claim twice now. Please provide a citation for these papers, or must we take you at your word even as you refuse to take NASA at theirs? I would love for someone to show me a craft/vehicle in which it's engines thrust directly back onto its own body. Why is this a reasonable request? I suggest you look at a diagram of the LM some time. If you do you'll see that the arrangement of the RCS thruster quads and the shape of the descent stage actually gives all of them a clear line of thrust in every axis. At no point do any of them actually 'thrust back onto its own body'. 1. I echo the comments above about reversing out of a driveway. reversing cameras are a new thing. I've done it enough times to know the exact movements I need to make with the steering wheel and the speeds required, I'm pretty sure I could do it blindfold. This is why astronauts spent so much time in simulators. 2. The 'just asking questions' is a common one employed here and in other forums where someone implacably opposed to the landings comes along all wide eyed and innocent to see how far they get. It doesn't wash. Asking questions requires that you accept answers from people who know the subject in greater depth than you, not reject answers with which you have an a priori disagreement. 3. You were given the title of a document in an earlier response. If you bother to look for that document you will find it contains information about a wealth of testing that was done on the plume deflectors. Likewise if you visit the NASA Technical Reports Server you will find many more documents on the subject. Your lack of awareness of those documents or their subject does not mean that the information is missing, or the thing that you think wasn't done is actually true. I'm not spoonfeeding you links. If you are genuinely seeking answers you have all the information you require to find them for yourself. 4. Completing the assembly of the LM on the pad is not a question of hiding anything, it's a matter of managing the construction timeline. Again if you search hard enough you will find forums where the people involved in these final construction phases actually contribute to discussion. Try telling them that they did not do their job. 5. You are employing another technique commonly used here, which is to identify a minute detail that you believe shows some inconsistency and using your limited understanding of that detail to try and disprove the landings. This is totally inappropriate - you need to consider the entirety of the evidence and place your small detail in context. Photographs exist of those lunar module plume deflectors on a lunar module on the lunar surface with Earth in shot, and Earth that is provably showing exactly what it should in terms of weather and the position and configuration of the terminator. 1. I echo the comments above about reversing out of a driveway. reversing cameras are a new thing. I've done it enough times to know the exact movements I need to make with the steering wheel and the speeds required, I'm pretty sure I could do it blindfold. Another comment about reversing cameras: they weren't put in to assist in reversing out of a driveway onto an open road, they were created primarily to help reversing into a parking space, or for vehicles with no rear windows to provide a better view behind than could be provided by wing mirrors alone. In all cases they are there to stop you reversing into something or someone and either injuring someone (or backing over someone's cat) or damaging your vehicle. None of those considerations apply to landing a spacecraft on the Moon when you are the only moving thing for miles and all you are trying to do is land on a big open space. Those small windows give you plenty of vision to see craters and boulders coming up under you, and they only need to be small because the astronauts are standing up right next to the them. The original LM designs had huge windows because the original plan was to have seats, and that meant wide panoramic windows were required to give the astronauts a decent field of view from a seated position. Delete the seats, have them stand, and the window can be much smaller. In my decidedly unprofessional experience, you don't need to be a rocket scientist to think things look odd, but sometimes, you do need to be one to understand why they're not. Hi Everyone, I appreciate your responses. And yes I am not a naïve guy who just wandered in. But I am not a "hunchbacked" either. To be honest I don't know what to think anymore. I don't have a agenda. But having immersed myself in the subject over the years, some things continue to nag at me. I don't have blinders on and I am sure there are reasonable answers to many of my concerns. With regards to backing up in your driveway. I was just being a bit cynical to illustrate the visibility we require today. But to suggest, as some here have, that two small windows on the LM were adequate for the job shows people have certain predisposed views. Those windows were in no way adequate, let alone ideal, in maneuvering that craft. I would suggest, if we could, ask the crew of Apollo 17 if those windows were adequate. They literally landed 2 feet away from almost certain death. Not only did one pad land in a small crater, the entire craft missed a very large crater by 2 or 3 feet which would have resulted in the craft tumbling over and death. I am 100 percent certain they had no intention of landing that close. But they did because they had zero visibility below. It was a complete miracle the crew did not perish. If I were Cernan and Schmitt I would be irate that I was nearly killed because I was given a craft in which I am flying blind. So to suggest, on anyone's part, the LM's design regarding visibility isn't, at very least, a bit puzzling demonstrates people may have blinders on. Again, just look at the DAC footage from these windows. You can't see directly below and your view is limited to maybe 15-20 percent of the horizon. I don't have blinders on and I am sure there are reasonable answers to many of my concerns. A reasonable answer, in many cases, might be that your assumptions are wrong. Are you prepared to accommodate that answer? And in other cases you note the "suspicious" lack of documentation to address some particular concern. What if that concern wasn't really an issue among experts in the field? What does that say about your attempts to read intent into absence? Those windows were in no way adequate, let alone ideal, in maneuvering that craft. It was a complete miracle the crew did not perish. What standards are you using to evaluate acceptable risk in this scenario? What were the exact causes of poor surface visibility during a P66 descent? ...demonstrates people may have blinders on. Please be more specific about what you mean here. Again, just look at the DAC footage from these windows. You can't see directly below and your view is limited to maybe 15-20 percent of the horizon. What makes you think the DAC footage accurately captures the pilot's experience? ie How do you maintain stability? The same way you maintain stability, say, in a jet-out condition. The DAP is a closed-loop controller with a non-uniform basis and independent-axis control laws. Once again, you asserted that there are published findings questioning the controllability of the LM with the plume-deflectors installed. Please provide a reference to it, as it seems the only evidence you have besides your personal incredulity.